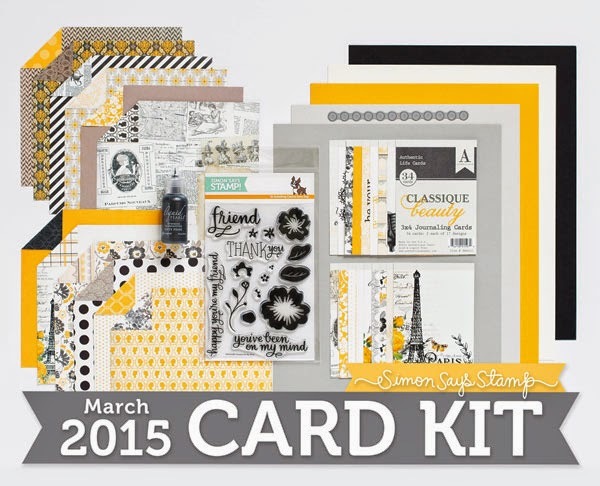 Today should be the day I share my first card created with the Simon Says Stamp March Card Kit. However… mine appears to be stuck in the mail somewhere… boo. So, I thought I'd do another request post. Now the kit is live and viewable, you can leave a comment here with any requests you may have for me. i.e. a product in the kit you'd like me to use; a technique you'd like me to try; anything really. Then, if (WHEN) my kit does arrive, I'll have a focus in mind! So here's the beautiful kit. All Spring-y and pretty. Love it. Anything catch you're eye? Anything you think you might be stumped with… let me know. Now it's time to announce the winner of my Simply Cards and Papercraft giveaway. That's all for today - I am busy busy busy today creating with Simon Says Stamp's next release (out Friday) and working on my next publication commission. Fun!! The SSS March Card Kit look gorgeous, love the happy colours, but I think the busy pattern papers (again) intimidate me, especially those shown on the upper left corner of the card kit photo. I would love to see how you use them. I always enjoy seeing what you do with the kits, Lucy! Looking forward to more inspiration from you.